I well remember first speaking with a Ten-Tec rep at the Ten-Tec Hamfest last year when the company first displayed the concept Model 539 transceiver, which was beginning to generate enormous interest. After viewing it, I casually asked the representative what the name of the new radio would be–? When he shrugged his response, I came to the point: “Will it be called an Argonaut?” “Time will tell,” he eluded. But in retrospect, I realized his response was not so much evasive, as it was fair–an honest attempt to protect the original Argonaut line’s name. Ten-Tec apparently wanted to finish the rig, to vet it thoroughly, and deliver performance that would live up to the legendary Argonaut status. Now, it appears they’ve done it. And the name? Yes, folks–Ten-Tec has officially christened the new rig the Argonaut VI. Ten-Tec, having been made aware of our avid interest in their new product, has been kind enough to provide QRPer with a preliminary spec sheet for the Model 539, and they’re permitting me to post it here, for the first time, today (see link below). As you can see at the top of the page, it very clearly states that the ‘539 will be called the Argonaut VI. Ten-Tec also allowed us access to the spec sheet for the new Model 418 Amplifier, which (to keep this post brief) will be featured in this separate post. 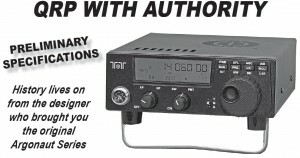 Ten-Tec tells us that the receiver on the Argonaut VI will perform much like the one in their Ten-Tec Eagle (Model 599). But you can hear it for yourself at the Hamvention: There, they’ll have a recorded contest playing over all of their rigs–including over the new Argonaut VI–so that hams can listen to and compare their receiver performance. DSP Selectivity: 100 built in DSP filters from 100Hz. Frequency Coverage: 160 through 10 meters with the exception of 60 and 12 meters. The Model 539 Argonaut will be available late fall of 2012. Though the software is in final stages and almost ready for Beta testing, Ten-Tec says they are still ironing out the parts list and firming up lead times and prices. They will not, alas, have a price for the Model 539 Argonaut VI at the Hamvention, but say that they will have firm pricing on the Model 418 Amp by then (more on that here, and to come). The Model 539 will only draw 550 mah on receive unsquelched. That’s not as low as an Elecraft rig, but for a Ten-Tec rig (that consumes a little extra juice for audio fidelity) that’s a fairly miniscule number. Especially considering that its predecessor, the Argo V, consumed nearly double that figure on receive. In fact, I’ll bet it’s the lowest receive current on any digital/DSP transceiver they’ve ever produced. Indeed, this Argo VI is almost as good as the venerable Yaesu FT-817 unsquelched. As a result, I imagine this new-generation Argonaut will be a great radio to take to the air on Field Day, or even to take backpacking/HF-packing. If the price is competitive, and that’s still an if, this could be a real winner for Ten-Tec, offering high-performance on a QRP budget. If so, this may be an affordable way to get into a top-quality new radio whose performance is benchmark-able. Couple it with the Model 418 Amplifier to provide 100 watts output as needed…Quite promising! The Argonaut VI (and Model 418) will be on display at Dayton, and will be fully-functioning. I’ll be one of the first visitors at their booth in Dayton Friday morning, and plan to post further details (and possibly a few photos) during the Hamvention. So, check back and follow the tags: Ten-Tec and Dayton. So, what could the Argonaut name mean for this rig, in terms of performance? Time will tell! Just to be clear, all of this information came from straight from the horse’s mouth at Ten-Tec and is accurate-to-date. We’re grateful to the folks at Ten-Tec for giving QRPer a preliminary look into these two products prior to the Hamvention, and allowing us to post their sheets so our readers can take a first peek. Thanks, fellas! This entry was posted in News, Product Announcements, QRP, QRP Radios and tagged Argonaut VI Spec Sheet, Interview, Interview with Ten-Tec, Model 539, QRP, Ten Tec Argonaut 6, Ten-Tec, Ten-Tec Argonaut VI, Ten-Tec Argonaut VI Spec Sheet, Ten-Tec Model 539, Ten-Tec Model 539 Features, Ten-Tec Model 539 Spec Sheet, Ten-Tec QRP. Bookmark the permalink. Thank you for helping squelch the mindless speculation that’s taken place on the online forums. I am looking forward to seeing this Argonaut on the air! Might have to upgrade from my 509! I can’t wait, this will be a nice little package for me. Thanks for the info, Tom. I know you’re a TenTec fan (so am I) but that 12m omission really surprises me. I guess they just couldn’t design the rig at the target price with all bands, which makes me wonder what that price will be. My ancient Index QRP+ has all bands 10-160…and that’s from the 1970’s. It will be interesting to see how this rig sells, but for me it has all the charm of a smile with a missing tooth. Kelly–Thanks for the comment. Yeah, I try to stick with the facts or at least run on information from very reliable sources with integrity. When I’m not sure of something, I’ll make that clear. It was funny when I posted the scanned images of the TS-990S–I received so many messages that it was a fake and that Kenwood would never release a photo prior to Dayton. I didn’t even bother responding, frankly. They could figure it out when they got their own QST in the mail. 🙂 Thanks for reading and keep in touch! John–Yes, I’m certainly a Ten-Tec fan through and through. Admittedly, I’m just as much an Elecraft fan, though. We live in a good world when 2 world-class manufacturers are easy to contact and have great customer service and they happen to produce my favorite stuff. I agree than full HF coverage would make sense. For me, I rarely use 12 or 60M, but I know having them could mean working an interesting contest or band opening. I’ve got to assume there’s a reason they’re compromising–I’ll ask them at the Hamvention. I’m VERY happy they included 160M (I just hung a massive horizontal delta loop that tunes 1:1 on even the lower part of the top band). I had the QRP+ (the ++, actually) and loved it. Such a cute little cube. I miss it on occasion. John, are you going to the Hamvention? No, not Dayton but I’m thinking of going to HamCom in Dallas in June. Did I really read correctly, “Typical receiver sensitivity: < 1 uV" ? Modern RX have MDS figures down around -135dBm, so I assume this must be a misprint. Not having ever owned a Ten-Tec radio I am unable to judge what to expect, but an HF transceiver not much larger than an FT817 with 10W and a decent receiver at the right price is interesting. Puzzled why they should leave out a band like 12m though. Surely the cost savings by doing this must be minimal. Also, 50MHz is surely a standard band in most modern radios. I hope they consider this for argo 6 .